In-floor electric radiant heat is a new hot trend in commercial projects these days. It’s an easy way to provide supplemental heating for offices and other workspaces and can be activated at the local level, enabling individual occupant comfort. Rather than moving heated air as a hot air surface does, it uses a warm surface to transfer heat to people and into a space. Line voltage and low voltage systems are available designed specifically for floating engineered wood, hardwood, laminate, luxury vinyl tile, and ceramic tile floors, with power consumption measured by wattage output per square foot. Standard wattage density is 8-12W per square foot, which does not exceed warranty requirements for most floating floors. The systems are easy to install, requiring the services of a licensed electrician only for the final hookup of lead wires at a central electrical box. Be sure to look for systems that are tested and UL (Underwriters Laboratories) listed, UL-Canada ETL, or CSA (Canadian Standards Association) listed. Additionally, there are six key reasons that supplemental in-floor electric radiant heat is a good decision for commercial buildings. 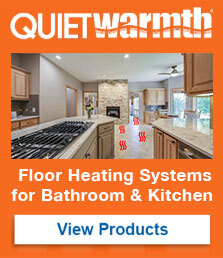 (1) System Simplicity: Installed over a subfloor and under a finished floor, in-floor electric radiant heat systems feature just a few main components: the heating elements, which can be heating cables, heating film, or heating mats or mesh; an in-floor sensor that monitors the temperature of the floor, not the room, and aims, typically, for a setting just a few degrees above room temperature; and a GFCI thermostat that gives office occupants local modification of their work environment. (2) Adjustable Control: Programmable thermostats can be set individually to help prepare a space for occupants at the start of each work day, providing highly customizable comfort. This is beneficial given that local control of temperature and lighting has been shown to improve employee satisfaction. (3) Useful for Non-Traditional Spaces: In-floor electric radiant heat is a good option to supplement primary heating systems in buildings with offices that, because of window configuration, orientation with respect to compass points and prevailing winds, or other non-controllable situation, are inherently colder than other offices in the building. It is also a great choice for offices created in converted lofts, former factories, or high ceiled repurposed spaces. (4) Increased Amenities: In other non-residential spaces, such as hotel and motel guest room bathrooms, in-floor electric radiant heat under tile can be a very nice perk and provide a touch of luxury underfoot. There are systems available that deliver electric radiant heat within an underlayment product that includes an anti-fracture membrane that isolates cracks in a concrete subfloor from telegraphing through to the tile surface. (5) Safe Operation: In-floor radiant heating is quieter and safer for supplemental heating than space heaters that may hum and can tip over when set up under or near employees’ desks. (6) Set It and Forget It: The systems are maintenance free, once installed they are out of sight and out of mind – just activate and control the thermostat.